I used to be a male model. It’s long way from where I am now and if I were ever to do it again I’d probably be better as ‘the before’ , rather than ‘the after’. Back in about 1973 my sister, a very beautiful girl, decided she’s like to start modelling. It was during the summer, and she’s a year younger than me, so she’d have been about 18. We were living in Oxford but she’d heard of a well-known fashion photographer, called Ken Walker, who lived in Brighton; and she asked me to take her, which I did. We drove to Brighton and found Ken’s house, where he had his studio. After a cup of tea Ken took us to some locations around Brighton, in his black Mercedes, to capture a variety of shots and then we returned to his studio to take some more. While we were there Ken suggested that I should become a male model and that he could recommend me to some top agencies in London. Well, it sounded like an interesting life so during the following week I arranged a photo-shoot with Ken and once more travelled to Brighton. I remember that one of the places we went to was Brighton Race Course and while we were there we saw the actor, George Baker walking his dog. Baker, at the time, was in a TV show called, ‘Bowler’. Ken and he said hello to each other and as we walked away Ken mentioned that he was good friends with Des O’Connor, as well…for some reason. Anyway, we spent several hours with the photo taking and he told me that he had spoken to the agencies, Peter Benison, Top Models, and some others whose names I can’t remember at the moment (might add them later if I remember). Ken said they were waiting for me to phone them. He also warned me that the fashion industry was not doing well then and many of the agencies were not taking new models on…but, he said, ‘you’ve got what it takes’ and he’d be surprised if I didn’t get signed on. So, anyway, I went to Top Models first, because a former girlfriend had been with them, but they weren’t interested. The next model agency I had an appointment with was Peter Benison. Peter repeated what Ken had said about the current fashion climate but said that I had, ‘a very useful face’ and to give him a week to consider whether he could find enough work for me to warrant taking me on. A week later he responded, with regrets. A nice guy. Bobtons, that’s another one. They were in the Kings Road. I didn’t go to see them until about 1975. I had to see ‘Annie’ (who was in the News of the World’ a few weeks later) and she sent me out immediately for a casting. It was in a mews house and there were lots of very experienced male and female models there looking very groomed and fashionable. I looked like a gypsy, really, with the clothes I wore; jeans, waistcoat, neckerchief, and earring, hair like it mostly is now, wild and curly. ..and I am, a bit. I never could get into this mirror-checking thing (as you can probably tell if you meet me), and never took modelling seriously – which is one of the reasons I didn’t get as much work as I could have I have been told. It was also because I wasn’t tall enough, fashion-conscious enough, good-looking enough, and not brash enough. I wasn’t professional enough. Anyway I was offered this one that Annie sent me to. It was some kind of American clothes catalogue and involved the models travelling to, and around, the States for a week, possibly two, can’t remember. I didn’t go, I’d just become a dad to a beautiful daughter, and I couldn’t bear the thought of being away from her. Bobtons didn’t offer me any more work after that; and I couldn’t blame them, it was an important contract. I walked away from the modelling for about four years. (Memories hazy). I know I did some cat walk stuff in Selfridges at some point; I enjoyed that (I’ve always enjoyed performing). Until I was a teenager I harboured dreams of being a professional actor. I was good at it too, except that I could never remember my lines – probably because I couldn’t be arsed to learn them, but also because I don’t have a good memory. While I was waiting in the wings I’d be learning what lines I had to say next. Once on stage it always went well though, and a few of my schoolteachers advised me to take up a stage career. We toured local hospitals and care homes. We did plays and operettas, and because I had lead roles in those I had to sing – even though my singing sounds like something being strangled. How I came to be signed up with an agency in Baker Street, London (not the Sherlock Holmes one) I can’t recall, but I was. 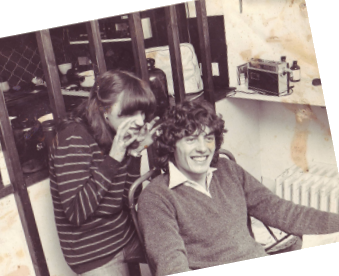 With them I did TV adverts for stuff like jeans, brochures, catalogues and record covers…and hair products (yes, hair products); Wella and Schwarzkopf were two. I was in Vogue and also lots of teenage magazines’ stories, front covers, like Photo-Love, Photo Secret Love, Mates, and others. That was good fun and I met some lovely people. The mixed dressing rooms were an eye-opener. Of course most of the girls were gorgeous; and one or two set my heart a flutter. We had lots of laughs modelling, but there is also hours of tedium and waiting around. When you are not on a shoot you’re tramping round the crowded streets of London, catching taxis and tube trains, carrying your portfolio and sometimes a case with your clobber in. 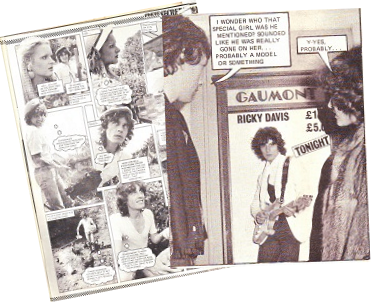 I was often approached by both women and men with strange offers, especially around Soho and parts of the West End. One of these encounters still gives me the shivers. I was on my way to a casting and had just entered Leicester Square tube station (I think it was), and was looking around for directions when a bespectacled man approached me. He tried to strike up a conversation and asked me if I was looking for somewhere to stay. I told him I wasn’t and hurried on to my appointment, even though I was in good time. There was something creepy about him. Some years later I recognised the man. He was on television news. His name is Dennis Nilsen. He was convicted in 1983 for six counts of murder and two of attempted murder of men and boys who he had picked up by offering them a place to stay. It is suspected that the true number is at least 15. As I said, he creeped me out. I’d given up modelling by then except for an occasional local gig. So, if you’ve got an ‘after’ and you are looking for a ‘before’ in your advertising campaign, you know where to come. This entry was posted in Confessions, Crime, Demons, Ellis Taylor, Intuition, Protection, Uncategorized and tagged dennis nilsen, fashion, intuition, ipc magazines, kings road, london, londonunderground, male model, mates, model, modelling, photo secret love, photo-love, photolove, Schwarzkopf, serial killer, soho, television, vogue, wella, west end. Bookmark the permalink.